Altogether, a masterful piece of fiction. Story blurb: Manhood is about more than who’s on top. Wulfstan, a noble and fearsome Saxon warrior, has spent most of his life hiding the fact that he would love to be cherished by someone stronger than himself. Not some slight, beautiful nobody of a harper who pushes him up against a wall and kisses him. In the aftermath, Wulfstan isn’t sure what he regrets most—that he only punched the churl in the face, or that he really wanted to give in. Leofgar is determined to prove he’s as much of a man as any Saxon. But now he’s got a bigger problem than a bloody nose. The lord who’s given him shelter from the killing cold is eyeing him like a wolf eyes a wounded hare. When Wulfstan accidentally kills a friend who is about to blurt his secret, he flees in panic and meets Leofgar, who is on the run from his lord’s lust. Together, pursued by a mother’s curse, they battle guilt, outlaws, and the powers of the underworld, armed only with music…and love that must overcome murderous shame to survive. Warning: Contains accurate depictions of Vikings, Dark Ages magic, kickass musicians, trope subversions and men who don’t know their place. I like the late Saxon era for the pivotal role it played between the old and new beliefs, both socially and religiously, and for the strong masculine values it harboured. However, I must say the title The Reluctant Berserker [Samhain Publishing, Ltd., February 25, 2014] threw me off at first. 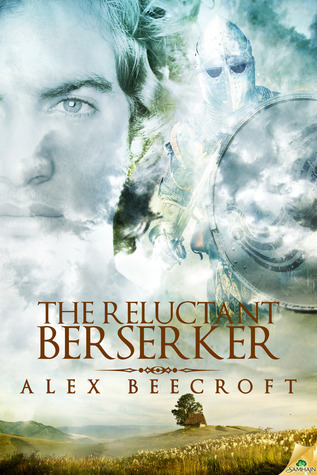 Nevertheless, the well-acclaimed reputation of Alex Beecroft as an historical fiction writer held my interest. If there is one word that sums up both the writing and the plot, it is ‘balance.’ The writing is a balance between lean narrative and poetic description, and the plot is a balance between romance and adventure, as well as love and adversity. Even the language is a balance between modern and old English. i.e. ‘Scop’ meaning musician, and ‘Wycce’ meaning witch or witchcraft, etc. Wufstan is a Anglo-Saxon soldier in the service of Lord Ecgbert, and as such he is expected to be the epitome of masculinity. However, Wufstan has a covert desire that he dare not reveal, and this is brought into conflict when Leofgar corners him for a passionate kiss. Uncertain how to react, he rebuffs Leofgar somewhat violently; nonetheless, the spark has been ignited. Leofgar and his maser, Anna, are then exiled from the village to wander, and as winter approaches the beseech a rather lecherous lord to be allowed to occupy a place in his forest. It is here that the aging Anna dies, and when the lord comes to collect his ‘favour’ Leofgar flees. Meanwhile, Wufstan unintentionally kills his best friend Cenred (who is about to reveal Wufstan’s secret), and consumed by guilt he leaves the village as well. Before he leaves, however, Cenred’s mother—a Wycce—curses him with one of her spells and then follows him to see it work. Now that Wufstan and Leofgar are both outcasts, fate arranges a chance meeting of the two, and from that point on they give in to their feelings to fight the forces that would destroy them; both physically and as a couple. There is little that one could criticise about this story, for every minor shortcoming—like an overly convenient plot twist—was balanced by flawless writing and evocative settings. Altogether a masterful depiction of time and place. Four and one-half bees. It is a collection of people, facts and events in Canadian history, and includes a bibliography of interesting Canadian books as well. Latest post: Farley McGill Mowat: A consummate Canadian. If you would like to learn more about my books, or to order copies, click on the specific cover below. Two Irish Lads and Nor All Thy Tears are available in both Kindle and Nook formats. Publisher’s price, $4.95.